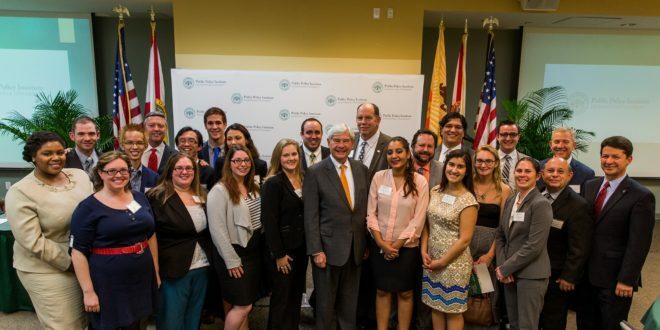 Jacksonville University has established its Public Policy Institute for the right reason: to function as a proactive, rather than reactive, service to the public, former Florida Governor and U.S. Senator Bob Graham said at the Institute’s Board of Advisors meeting Feb. 16. 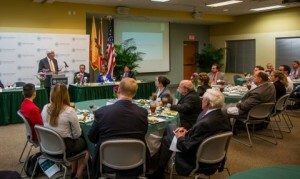 Community leaders, JU Master in Public Policy students, members from student organizations such as JUSA, Political Science majors, College Republicans and other guests heard Graham praise the University for examining the needs of its campus and surrounding community and then creating the PPI. 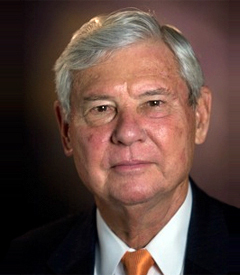 The founder of the Bob Graham Center for Public Service at the University of Florida noted that UF has been authorized to begin offering graduate public policy programs, and that he hopes UF and JU can work together to share best practices. In his presentation, Graham discussed challenges facing Florida in coming years: population growth, job s preparation, the economy and education. He stressed the importance of civics education in public schools and the need for individuals to actively participate rather than be spectators. Graham is a graduate of Harvard Law School and served as Florida Governor from 1979 to 1987 and U.S. Senator from 1987 to 2005. He ran for President, seeking the 2004 Democratic nomination. When first running for governor of Florida in 1978, his signature campaign move was “The Graham Workday,” in which he trained for a job and then worked in that industry for a full day. He continued these workdays as governor and senator, putting in 386 workdays total in a wide variety of positions. After retiring from politics, Graham served as a senior fellow at the Harvard Kennedy School of Government, and was a Commissioner on the Financial Crisis Inquiry Commission and Chairman of the Commission on the Prevention of Weapons of Mass Destruction Proliferation and Terrorism. In 2010, Graham was appointed Co-Chair of the National Commission on the BP Deepwater Horizon Oil Spill and Offshore Drilling. In 2006, he created the Bob Graham Center for Public Service. Read more about Graham here. The Jacksonville University Public Policy Institute is a neutral gathering place to discuss policy matters affecting our state and community. Offering the only Master in Public Policy degree in Florida, the Institute prepares students for leadership and diverse career opportunities in the public, private and non-profit sectors. The Institute’s 25-member, nonpartisan Board of Advisors is a diverse cross section of some of Florida’s most respected and successful business, civic, and community leaders in education, finance, banking, public infrastructure, healthcare, law, and transportation. More information is at ju.edu/ppi.